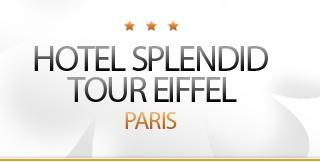 Hotel Splendid Tour Eiffel, Paris. 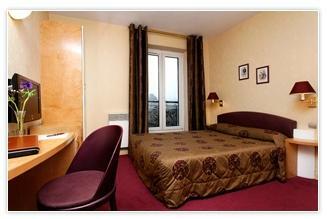 Splendid Tour Eiffel Hotel Paris. In the heart of Paris, close to Champs de Mars and Military School, the Hotel Splendid Tour Eiffel will give you a unique charm of a typical Parisian hotel realized with the Art Déco and characterized by sophisticated and elegant ambiences, very luxurious with 48 rooms and suites, which all overlook the Eiffel Tower, a special luxury unique of this structure. Elegant and accurate common areas like Bar and Living Room, where you can feel our warm welcome thanks to the objects and decoration chosen with care, as well as the colours of the rooms, perfect in order to enjoy a drink, a glass of champagne, organize an event or a business meeting; the structure offers an unforgettable stay thanks to its marvellous character and personality. Inside a splendid palace of the 19th century in a beautiful district, the hotel offers a big choice of services and amenities, including: double glassed windows, strong box, Wi-Fi internet connection and every modern equipment, public parking in the neighbourhood, satellite TV, mini bar and access for disabled people. In the morning, you can taste a continental buffet breakfast, served in your room or in our splendid decorated breakfast room with lively colours and beautiful pictures of Paris, where you can choose among a big choice of: fresh fruit, delicious products typical of the best French tradition. The rest of the structure is perfect for all, in order to welcome you in every moment of the day with its precious lobby with Art Déco armchairs, warm and tranquil areas, perfect for your relax, in order to read a book or enjoy a tranquil moment. Strategic situation, charm, comfort, relaxation and class: your destination can be only this, for every kind of travel you have to do in the French capital, we have always the right solution, technology, welcome and professionalism perfect for you.